WE DISTINCTLY REMEMBER the last two years of FFR as the shows at which we began asking ourselves How many reel companies can the fly fishing market support? The answer may have come this season, as fewer reel companies appeared with new products, and the ones that did spent a great deal of attention to intricate and fanciful reel cosmetics — something fly fishers seem never to tire of. 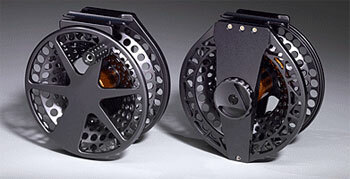 Tibor has issued new 8-, 9- and 10-weight versions of their popular new Tibor Spey reel. Though the new sizes had been planned for mid-way through 2009, they were available to retailers at the show for the first time. Tibor also is expanding their engraving program for new Tibor, Tibor QC and Tibor Light reels with a new Freshwater Bass Engraving option. Meanwhile Abel Reels, always known for their finishing and anodizing, has been consistent in the last few years in releasing colorful and, in many cases, beautiful new paint jobs for their existing reels. This year is no exception, with the new Derek DeYoung Series of specialty reels featuring DeYoung’s popular fish-face artwork. Abel also added new models: the 3N Trout and 4N Trout, priced from $425 to $500, that are available with both wide and narrow spools. This year Bauer brought back an old classic with the appropriately-named Rogue Classic 6 ($575), a large-capacity reel with a closed (rather than vented) frame, intended primarily for spey fishers who need a little added weight in the reel to balance their long rods. Hardy also showed confidence in a long-time best-seller with their re-released St. George, available in 3-inch and 2 9/16-inch sizes ($795). And what can you say about a 4 1/4-inch salmon reel built to commemorate the 700th anniversary of first Duke of Northumberland, “Harry Hotspur”, who was shot through the head with an arrow while inspecting his victorious troops? 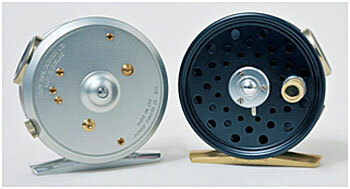 The St. George Hotspur, a two-crank salmon behemoth based on the original 1921 model, is offered with either a standard or mid-arbor spool and is now built with modern materials. This year Hatch Outdoors is taking a page out of Abel’s book with the beautifulLance Boen custom series of reels, which feature deeply-etched abstract artwork similar to the fish and animal drawings Boen has typically engraved on leather. The reels are gorgeous but pricey: $1200-2650. Waterworks/Lamson has a new serious bluewater reel in the Vanquish series, available in 8-weight to 12-weight sizes ($800 to $900). Like many Lamson reels, this reel seems designed for visual impact: we’re guessing you’ll either love it or hate it. Also like other Lamsons, this one has a very strong sealed central drag core, and a somewhat unusual reel seat machined right into the crossbar of the frame (instead of on its own pedestal). 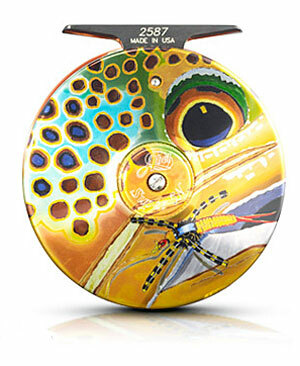 Nautilus’s new NV 11/12 reel won an American Angler Dealer’s Choice award from retailers at the show. This is a beefed up version of the popular NV, which previously topped out with a 10-weight model. The NV 11/12 should handle tarpon anglers’ needs nicely while also pulling double-duty as a light bluewater reel for albacore or small tuna. Ross Reels has two interesting new releases this year: the first is a fully-machined, all-metal Evolution LT ($245-315), covering 1-weight through 9-weight sizes. Ross has eliminated plastic in the reel’s core, and besides feeling and sounding quite solid for a lightweight reel, it’s very pleasing to look at. Ross also released the Balance Adjustable Reel Arm ($139), a tool similar to the Abel Arm, which was released many years ago, meant to move the reel away from the caster’s belly and make it balance larger rods. 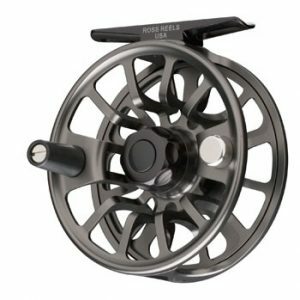 Ross’s model improves on Abel’s in being adjustable and interchangeable between different reels, though it may not be as sturdily built (being adjustable, some parts have to slide).